The truck economy was one way for the mining industry to share the spoils of this highly "ecology-insensitive" industry with the local people. Mainline companies such as Sesa Goa, Fomento and Lithoferro offer trucking contracts to locals affected by the mining. 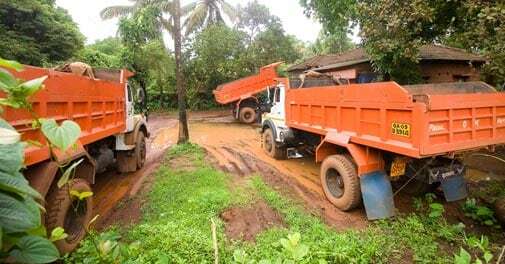 Almost every house in the vicinity of an iron ore mine in Goa's Sanguem, Sattari and Bicholim talukas is likely to have a 10-tonne tipper truck parked in its backyard. Some have two, three or even four trucks parked. 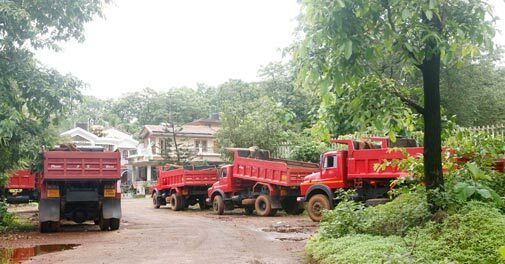 In all, there were about 25,000 such trucks serving the iron ore industry in Goa . Until recently, these trucks ferried ore from the mines to ports and other locations. That changed in September, when mining operations came to a standstill after a temporary ban imposed by the state government. The trucks are now idle. On December 7, an expert panel set up by the Supreme Court recommended cancellation of 42 iron ore mining licences in Goa. The iron ore industry has been accused of destroying the ecology of the region. Anthony Fernandes, a resident of Codli in South Goa district, has been protesting the destruction of water tables by mining near his house. The well on his property goes dry in March. His daughter Pearl, 21, has been writing to newspapers complaining about the practices of the mining industry. Yet, there are two trucks parked in the property. Fernandes says they belong to his sister. "They do not have space to park," he says. Apart from causing pollution and blocking roads for hours on end, the trucks were said to be responsible for one death a day in the state. How does the mining industry share its profits through the trucks? A truck costs around Rs 12-14 lakh, and EMI on the loans cost around Rs 30,000 or so every month. These loans are guaranteed by the mining companies. The owner of the truck easily earns around Rs 12,000-Rs18,000 a day for about 160-170 days in a year. After paying EMIs, the driver's salary and the fuel costs, the truck owner makes Rs 16-18 lakh a year. That is around Rs 1.5 lakh a month. In some of the busier mining areas it is even more. In addition to trucks, the locals often also invest in mining equipment. "They do not even need to buy. They can lease it (equipment) and then (sub-)lease it to mining companies at an even higher fee," says Vijay Kumar Uday Desai, a farmer at Pissurlem. There are also around 400 barge owners transporting ore.
"This easy money is destroying us," says Desai. While he protests mining, members of his family have invested in trucks. "We were a group of nine friends in school, and today five of them are dead. The easy money led to drinking and gambling that killed them," he says. Desai also explains how gambling has taken firm root in Goa and how temples actually have to auction sites at fairs to gambling organisers. There are so many gambling organisers and so much demand for such games at fairs that auctions are the only way out. Truck and barge owners are in a quandary now that mining has come to a halt and are seeking assistance from the state government. They have approached Chief Minister Manohar Parrikar for help to repay their loans and develop alternative means of livelihood. Some respite came from outside the state in early December. More than 100 of the trucks have been contracted to carry garbage in Bangalore. BVG India Ltd, which has the contract for garbage removal in Bangalore, sent its representative to Goa to sign up the idle trucks. The trucks are now getting painted green, the designated colour of garbage disposal vehicles in Bangalore. The colour is a little ironic, considering their not-so-green past.